UPDATED APRIL, 2007!! 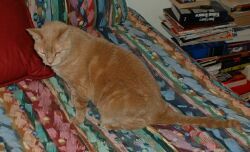 Sadly, Grimalkin, our oldest cat, had to be euthanized recently. 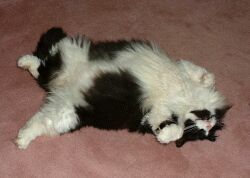 She was over 19 years old, having come to us in early 1988, and she just "wore out" her body. She was laid to rest with her son, Zonex, alongside Flea and several of our other cats. "Granny Grim" was a fixture around the house for so long that we simply took her for granted and thought she would live forever. I guess I'm the male equivalent of the "crazy cat lady" that always seems to live down the street. The cats own the house and allow me to live here as long as I pay attention to them and feed them on a regular basis. Scout continues to stay with me, along with Winkie (now called Gwaltney, center in the picture above) and Innocuous (top left in picture.) 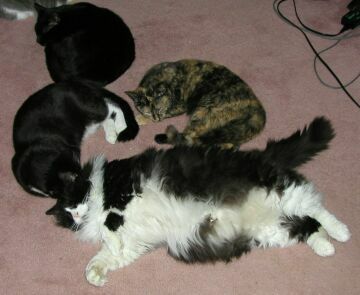 Flea (left in picture) passed away several years ago. Of the younger cats, Punkinhead (formerly Pointy-Head) is the only one to stay with me for any length of time. He's as fond of Scout as Flea was. He's in the center of the picture below. Oddly, he was not part of this litter of kittens. He just showed up one day and joined them, even though it was obvious that he was larger and older than the others. 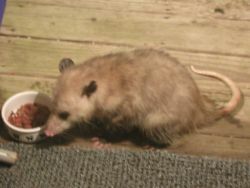 Melanie hangs around the neighborhood and occasionally helps herself to some food, but she has never spent much time with us. Grimalkin was the one and only original barn cat. She was supposed to be a long-hair. Obviously, it didn't work out. She has a tendency to lose body parts, too, and had only half a tail and 3/4 of an ear. She had only one litter of four kittens, but she did a super job with the one we kept: Zonex. 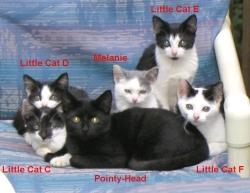 Grim was doubtless the only cat to have her kittens named after Radionics alarm software programming modules: Zonex, Comex, Popex, and Aux B1 (honest!). 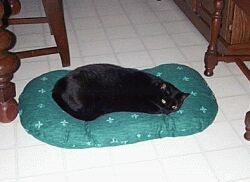 She lived to the ripe old age of 19 and was euthanized in April of 2007. Zonex, or "The Chosen One", was the only one of the litter to be chosen to stay with us. (The rest went to good homes.) He was a beautiful brown tortoiseshell with amazing claws. A natural hunter, Zonex always loved to bring us little surprises...and he wouldn't eat them until we come out and complimented him on his skills. Zonex was named after an alarm control manufacturer's software module, but he also answered to Zone, Zoney, Zone-Boy, Zone-Boy Slim, Zonexio, and Buddy. He was laid to rest on November 2, 2001, after a fight with cancer. We miss you, Buddy. Innocuous was rescued from a horrible fate when my wife took pity on her at a vet's office. She had already been declawed, so we were a little late on that score, but she was a very affectionate girl (except for my having to go and get a tetanus shot the day we got her...don't stick your fingers near a nervous cat.) Nocs spends mornings helping us shower and get ready for work. She's pure black and used to love to lurk in dark corners to surprise the other weasels. In the past few years, she's gone a little nutty and it's probably due to her morbid fear of Scout and Gwaltney. Neither one of them loses an opportunity to chase her. We also have a female cat named Isabeau. We used to see her only if we would lie down on the bed and were very quiet. She would then come out from under the bed and let us pet her. Basically, she spent 23 1/2 hours each day under the bed. She now has her own bedroom and seldom comes out unless I forget to check her food and water bowls. We inherited her several years ago from somebody who moved. She is about ten years old and has been declawed. Gwaltney is a neutered female. She has a distinctive, squeaky meow. She loves Uncle Scout and is around him constantly. Her real name is Vomit, due to her coloration. Later, we started calling her Winkie. Finally, it became Gwaltney. Gwaltney is rather retiring, unless Isabeau comes around. Then she's "off to the races" to chase Isabeau back upstairs. She is notorious for suddenly taking off on a wild run through the house for no discernible reason. We have a tom-cat named Blondie. He is of average size, but heavier than Flash, his brother. 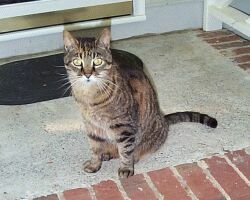 Unlike many tom-cats, he's quite affectionate and loves to stay inside and be held. He's usually outside when I get home and greets me by running alongside as I walk towards the door, meowing the entire time. He seldom disappears for any length of time. Flash is Blondie's brother and is quite a bit skinnier. Even though he is black, like Innocuous and Punkinhead, it is easy to tell them apart due to Flash's typical "skinny tom-cat" body. A bit more skittish than Blondie, he is still happy to have you approach him and pet him and will sometimes sleep on your lap, but he is more inclined than Blondie to spend time outdoors and will often disappear for days at a time. On of my most affectionate cats is Punkinhead. Punk just showed up with a batch of kittens one day. For some reason, he quickly became acclimated to us, while the other kittens remained semi-feral. He's been neutered and is a bit chubby. He has the bad habit of reaching for your chin with his claws...ends up looking like you had a shaving accident. He also loves to see you use the bathroom. If he even thinks you're going to the bathroom, he'll race you there to watch. I haven't named this cat, which is unusual for me. 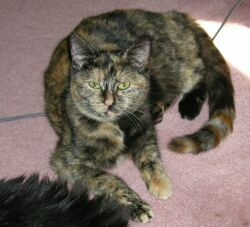 She's a very small calico female who is semi-feral. Still, she'll come in to see what's going on and acts like she would like to have enough courage to allow herself to get in my lap. Probably never happen, though. This funny-looking cat with a long, pointed snout will only come out at night. 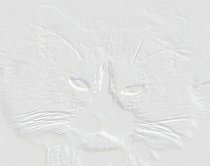 His name is Posslq. He also has a naked and scaly tail, which is pretty unusual for a cat. Another unusual thing is that he will eat just about anything, including green beans. 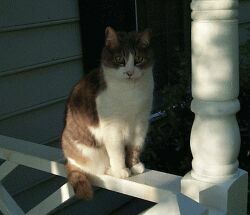 It is fairly normal to see Scout sitting on the porch very unconcernedly as Posslq eats from the bowl beside him. 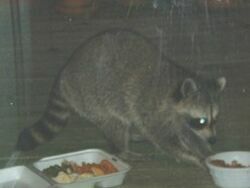 Posslcoon also seems to come around only at night. He doesn't pay much attention to the weasels, and he is also fairly unafraid of us. At least he washes before eating. We hope that this information proves helpful to you. One of the odd things about our weasels is that they either truly like each other...or they don't. There's very little in-between. Send mail to me. I would be particularly interested in your comments on the weasels.